Venice of the East and the romantic city, Udaipur is not less than a fairy tale coming to life. With some great hotels and resorts, Udaipur speaks of its rich history and culture. Amidst the ripples of lakes, Udaipur is a heartthrob for every visitor. 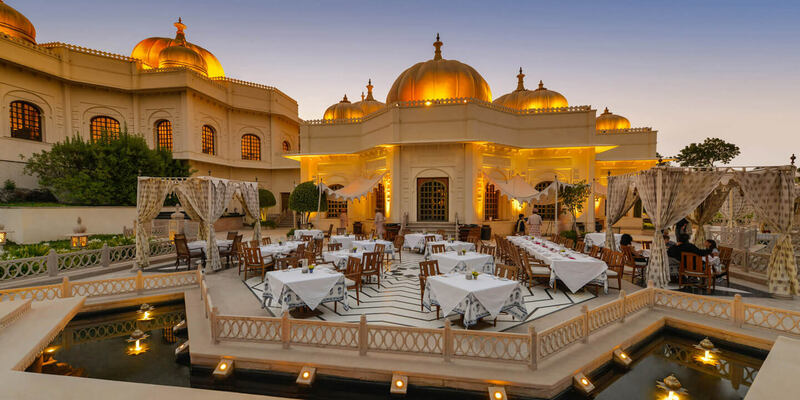 Unique among all the luxury hotels in Udaipur, The Oberoi Udaivilas is located on the bank of Lake Pichola. Standing on the 200-year-old hunting grounds, the hotel has a layout of corridors and domes reflecting the true art and culture of the city. An ideal place to make your vacation into a royal one, this property has heart-warming hospitality, great opulence, and spectacular location. Spread over 50 acres, the luxurious hotel also boasts of a 20-acre wildlife sanctuary inhabited by wild boars and deers. Along with all this, the hotel also offers recreational activities which include a city tour by boat and private dinner section under the lakeside dome. You can also enjoy the Ayurveda inspired Eastern, Western, and signature treatments of the hotel. Located on the Jag Niwas Island, Taj Lake Palace can easily be spotted shining in the lake scape of the city. An entity of the trusted brand of Taj, Taj Lake Palace provides a glimpse of luxury heritage and rich culture of the city. The facilities offered at the hotel have successfully paced with the facilities of the modern times. It also provides an excellent opportunity to rejuvenate yourself through Jiva Boat Spa. Imparting the true essence of royalty, The Leela Palace overlooks the beautiful Lake Pichola. The palace has been rated among the top heritage hotels in Udaipur. The tones of maroon and gold of the palace give a look and feel of a real palace of the bygone era. There is also a wooden work and glass work which provides a right contrast to the history as well as the present. Trident Hotels is among the famed hotels in Udaipur and is spread over 43 acres of land. Located near the alluring places of the city, the hotel has a rich architectural and historical significance which have been beautifully merged to one. The subtle shades of brown and white create the magic that soothes the senses of the guests. The most special thing about this hotel is the terrace alfresco, background view and lip-smacking food. Popular as a classic hideout, Boheda Palace is another famous heritage hotel in the city which is located in the old city area and walks away from the popular With hanging balconies, hand-painted roofs, and arched windows, Boheda Palace is reminiscent of Udaipur’s Rajputana past. If you are planning to stay here, you will be exposed to the Ayurvedic and other massages which are the best to calm yourself. You can also enjoy horse safari and painting classes. Giving you a feel like Maharajas, Shiv Niwas Palace is a former royal guest house offering a range of modern amenities. This crescent-shaped palace has been decorated with classic furniture and Rajasthani motifs. You can be a proud traveler to witness to its Vintage and Classic Car Collection, and also enjoy the Mewar Sound and Light Show. All these hotels offer sheer luxury amidst the lush greenery and glistening lakes of the Udaipur city. You can book any of the hotels in Udaipur and enjoy your stay here. Will China Change the Rules for U.S. Ecommerce?